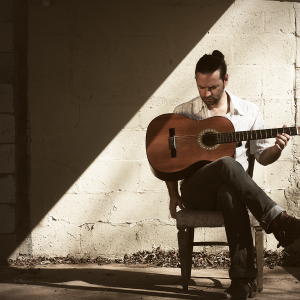 “Joshua is a strong blend of Folk and Soul. Like a white, folky John Legend.” – Plutonic Music Group, UK. A Nashville-based artist, his music has been featured in films, on TV and he’s recorded, billed, shared the stage across the nation with many greats, including Prince and The Mowgli’s. The sound that Joshua’s vocals and guitar playing exude is one that comes from true grit, and life experience. Where his voice will leave you wondering whether he grew up listening most to Sam Cooke, Stevie Wonder, or David Bowie, his guitar playing will remind you that the acoustic is still a driving force in recorded music today. As a writer and recording artist, his old-soul simple lyricism, old-school song forms, paired with a recording style that is current yet organic, come together to form a unique and refined quality that is atypical of modern recordings. It’s not surprising that his influences range from early Dylan and Tom Waits, to Stevie Wonder and Otis Redding. He also sites 30s-40s era Jazz, and classical music as a direct influence on his craft. Joshua has been writing music since age 12, and began recording at age 14. At 15 he had his first residency at a local coffee shop, and has been working professionally ever since. Joshua is a songwriter, producer, and recording artist with a long list of credits, but he also has an extensive background in TV and Film. Beginning at young age, he served as a primary producer, director, and talent as one of two students in the state of Tennessee to be selected for a paid internship with the Williamson County government access channel. He later furthered his education spending two years at Belmont University in Music, TV, and Film. In 2005, moving to Los Angeles, California provided direct access to freelance work and he began his profession as a multi-media artist and producer. That same year he formed the band Stereofox, which marked his first major recording, Ice The Symphony, released under True Source Entertainment, and Ecco Bravo Music, with producer, Deron Johnson (Miles Davis, Seal, Alanis Morissette, Stanley Clark). As a band, Stereofox was active from 2005-2011. In 2011 he began writing and recording music for solo releases, as both “Josh Smith”, and “Joshua” for film, TV, and online placements. You can hear Joshua on the October 26, 2011 Episode of “The Young and The Restless” (CBS) singing “Our Time Has Come” by David Kurtz. “Our Time Will Come” was nominated for an EMMY in 2012. He has shared the stage with many greats such as Prince, The Mowgli’s, Anna Nalick (hit song, “Breathe(2am)”), The Tokens (“The Lion Sleeps Tonight”), Sam Bradley (featured in Twilight soundtrack), Deron Johnson (listed above), Gary Novak (Chick Corea, Allan Holdsworth, Robben Ford), Chris Pierce (KCRW, BB King), The Northstar Session (NBC’s Parenthood), Lelia Broussard (featured Rolling Stone top 8 indie artist for cover). He has also worked with songwriters, Jeff Silbar (Grammy for Song of the Year for “The Wind Beneath My Wings” Bette Midler, triple platinum selling “China Girl” John Cougar Mellencamp, quadruple platinum“Goodnight Sleeptight Man” Kenny Rogers, #1 single for Alabama, and many others including Sheena Easton, Gladys Knight, Dolly Parton, Poco, Willie Nelson), Andrea Remanda (Jewel, Mary J Blige, Aretha Franklin, Cheryl Cole, Bryan Adams, Kylie Minogue, Tom Jones, Brian McFadden, Meatloaf), Andreao “Fanatic” Heard (Grammy winning “Speechless” Beyonce, Michael Jackson, Notorious B.I.G., Will Smith, Lil Kim), Mike Hartnett, Lamar Williams Jr, and more. Joshua’s work with nonprofits and benefits. Since his first opportunity to play a Multiple Sclerosis benefit in Columbia, Kentucky at age 15, Joshua has been utilizing his skills to promote and benefit causes across the United States. In February 2005, after Hurricane Katrina hit the Gulf Coast, he moved to Pascagoula, Mississippi to live and volunteer for a four month period. There he helped manage and lead groups, large and small, into the homes that had been flooded to teardown, rebuild, renovate, and build new structures and facilities. In 2010 after his hometown, Nashville, Tennessee was flooded, he produced and performed for a benefit concert in Los Angeles to called Play It Forward Nashville. The concert was broadcast on PeaceDay.tv as a livestream event, and was covered by the PeaceDay.tv podcast. As a part of Play it Forward Nashville he also produced a documentary short which was used to help raise awareness after the storm. He also created a blog called “100 People in Need”, that served to help collect donations for folks that had lost their homes and belongings during the flood. This fundraiser was managed and administered under Home and Community, Inc., a Los Angeles based nonprofit which helps communities in need. 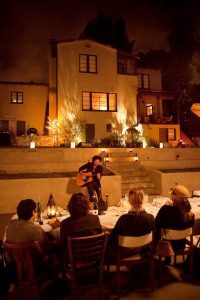 He also worked with Home and Community, Inc. on other fundraisers, performing for house concerts, and other functions. 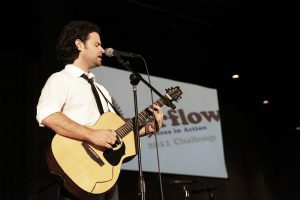 In 2011, after the major tornado in Joplin, Missouri, Joshua volunteered as a featured recording artist for “Overflow: Joplin” (a choir competition), to help raise funds for Watered Gardens, a local homeless shelter and mission. 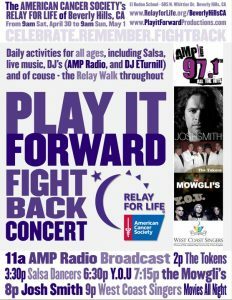 That same year, he produced the Play it Forward Fight Back Concert at the Relay for Life of Beverly Hills to benefit the American Cancer Society, and the Leukemia and Lymphoma Society. He was a featured artist at the concert, alongside The Mowgli’s and The Tokens.